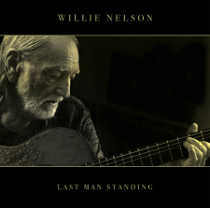 George Graham reviews Willie Nelson's "Last Man Standing"
Among the roster of performers who have come to be regarded as living legends, many of them tend to slow down a little by that time of that designation or perhaps retire, especially if he or she reaches the mid 80s. On almost everybody’s list for living legends among popular performers is Willie Nelson, the veteran singer, songwriter, guitarist and so-called outlaw country artist, who marked his 85th birthday in April 2018. But he is not a man to stand still. Willie Nelson has just released his 67th studio recording since 1962, called Last Man Standing, whose release coincided with turning 85, and I think it’s one of his best. It’s musically honest, a kind of essence of the honky-tonk style Nelson is so good at, and it’s also quite witty lyrically. Much as been written and said about Willie Nelson, his beginnings playing in bands since age 10, then working in radio after his discharge from the Air Force, with stints on Vancouver, Washington and Houston in the late 1950s before landing in Nashville in 1960 and working as country star Ray Price’s bassist. He wrote songs for others and in 1962, recorded his first album, and penned the Patsy Cline classic Crazy. After what was supposed to be a retirement from music in 1972, and a move to Austin, Texas, he became a catalyst for the burgeoning music scene there. In the early 1970s he released his albums Shotgun Willy and Red Headed Stranger which really put him on the map, then became involved with the outlaw country scene with Waylon Jennings, Kris Kristofferson and even Johnny Cash. Since then, he has not stopped, including making recordings in the 1990s to pay off his tax bills. In recent years, Nelson’s output has been both prolific and eclectic, collaborating with artists as disparate as jazz man Wynton Marsalis, reggae maven Toots Hibbert, soul legend Ray Charles, and rapper Snoop Dogg, to name a few. Along the way, Nelson has done a number of tribute albums of covers such as Tim Pan Alley standards and the classic country of Ray Price. Just a year ago, Nelson released God’s Problem Child which was a collaboration with producer and songwriter Buddy Cannon, with whom he started working in 2008. Cannon is known for his work with country star Kenny Chesney. Nelson’s album hit the top of the Billboard country charts last year and featured mostly a mix of covers and some original songs co-written by Nelson and Cannon. Now the two worked together again on Last Man Standing, and it’s Willie Nelson at his best, with a rather intimate band, delivering more of a honky-tonk sound than country, avoiding the country cliches, and even Nelson himself tones down some of his vocal quirks. It consists of 11 compact songs all co-written by Nelson and Cannon, with several of them considering mortality, which an 85-year-man can be excused for doing. But the song often take a whimsical approach, can be self-deprecating, and sometimes straight out funny. Among the notable supporting musicians are Alison Krauss on fiddle and Nelson’s 40-year harmonica associate Mickey Raphael. Willie Nelson’s new album Last Man Standing one of his best in recent years. It’s not a tribute to anyone or a collaboration with other performers, which Nelson has done a lot. It’s just Willie and a tasteful band doing new original songs, many of them quite witty, with several taking a whimsical approach to mortality. Nelson is still in top form vocally, and though his guitar playing is not spotlighted very frequently on the album, his guitar named “Trigger” does get featured here and there. The production is first-rate with the arrangements free of country cliches and often with a great honky-tonk groove. Our grade for sound quality is a B+ with the mix nicely balanced. But that is somewhat undermined the use of excessive volume compression to jack up the loudness by sacrificing the ebb and flow of the performance, something which is all too common. Willie Nelson has been making albums under his own name for 56 years now. At 85, he shows so signs of slowing down. On his 67th release, he may be thinking of mortality, but he does it with a sense of humor, and in the process, he has given us a one of his most entertaining of albums.